Scant information can be found about the Bibliophilist Society imprint (after a semi-rigorous search of digital resources), except brief references to titles published by the Bibliophilist Society of Paris (1822), London (1830-1940), Philadelphia (1892-1910), and New York (1929-1933). The London titles (with dates in the 19th and early 20th century) seem to be similar to the New York titles and are probably printed from the same plates around the same time. 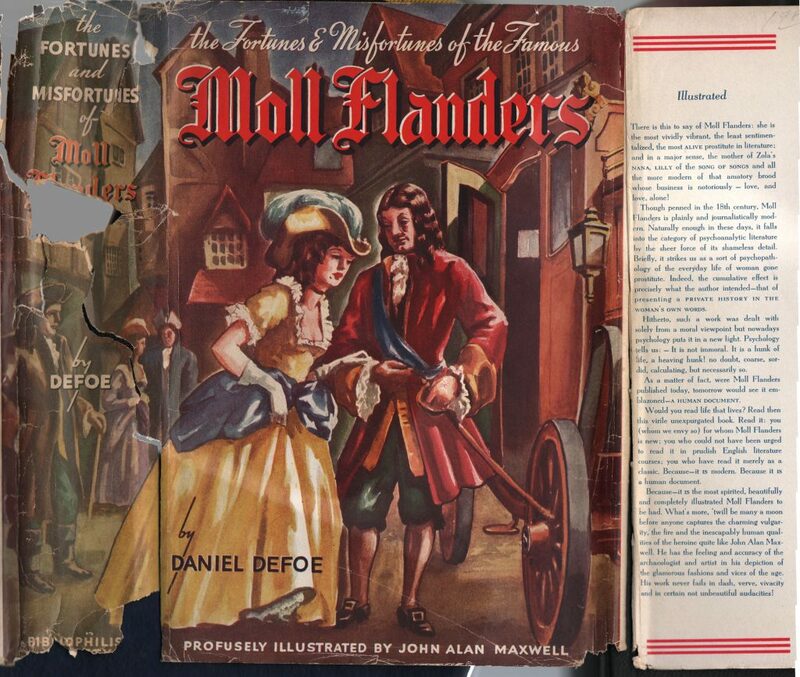 Some of the London titles have later dates (1950s-1980s). The other imprints (Philadelphia, Paris) seem to be actual bibliophile society publications, whereas the much more common New York and London imprint titles of the Bibliophilist Society are big, blustery reprints often with titillating illustrations, in the category of “Privately Printed” and other semi-under-the-counter titles sold in the 1920s and 1930s. 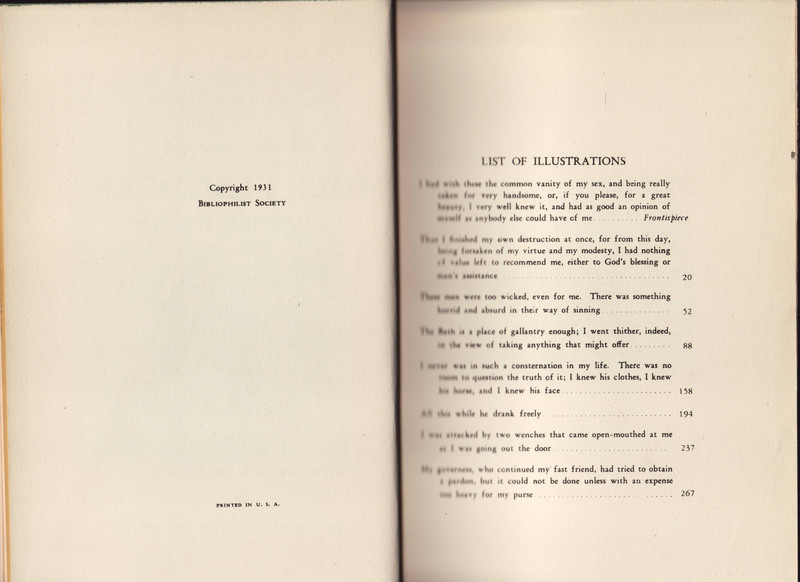 To avoid legal troubles (common with such titles, printed in the US, in the 1920s and 1930s) the actual publisher seems to have done a very good job of hiding their tracks. 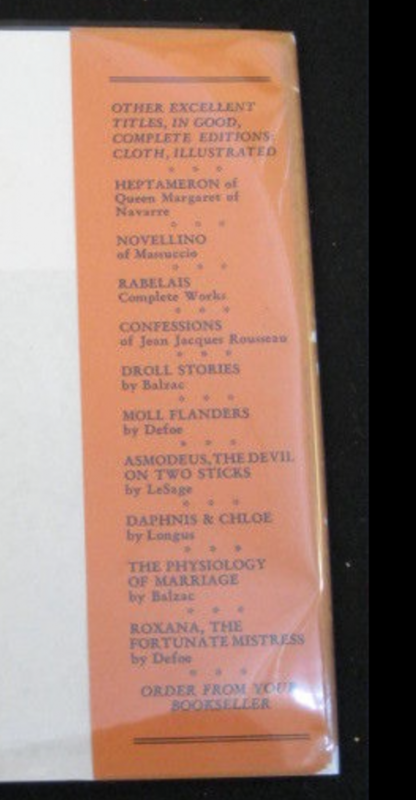 I can find only one mention of the Bibliophilist books in Publishers Weekly, in 1932, which mentions the imprint along with two others (Tudor Publishing Company and the Mason Publishing Company) as a source of illustrated classics, selling for as much as $7.50 at drugstores, but marked down to $2. The rear flap from a Bibliophilist Society book (ca. 1931) with a list of titles in the series. 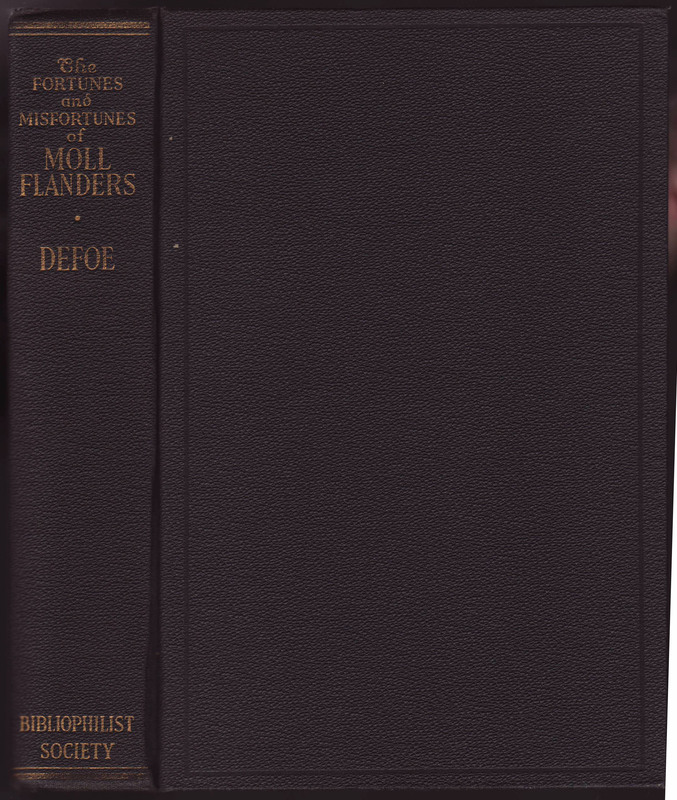 The copy of Moll Flanders, below, has a unique illustrated jacket (as do all other copies in jackets I have seen). 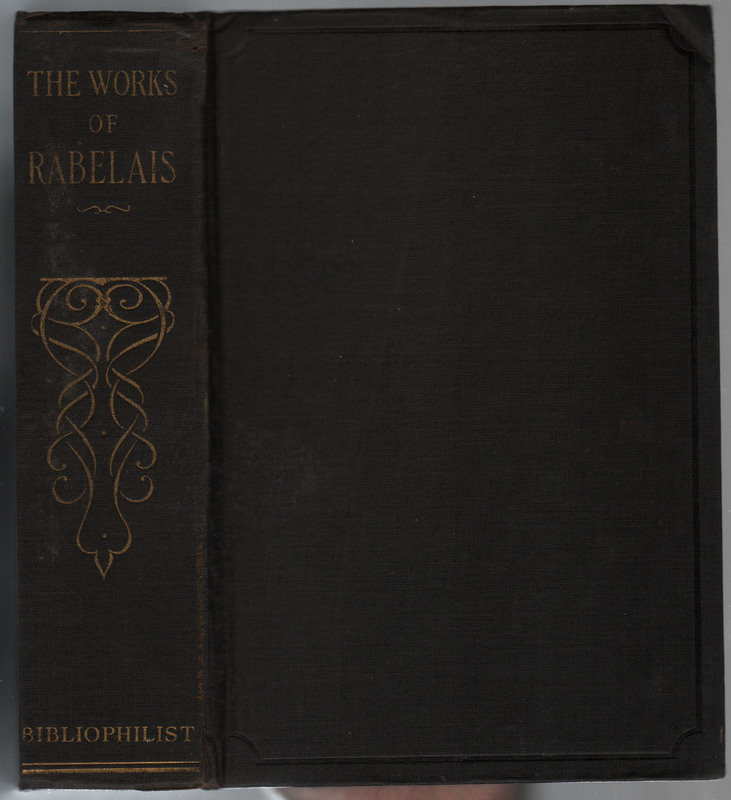 The Bibliophilist imprint is at the base of the spine, and the illustrator (John Alan Maxwell) is listed at the bottom of the jacket front. 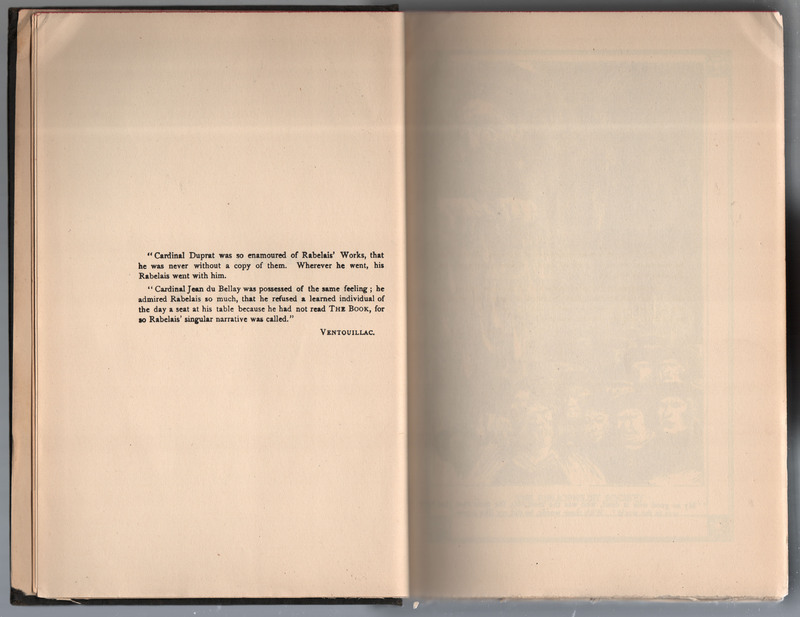 A long blurb about the book is included on the front jacket flap. There is no price listed on the jackets, suggesting they were sold as bargain mark-downs (on “sale” all the time). Bindings are some kind of plasticized material, in black, with gold stamping. There is no half-title page in this book. 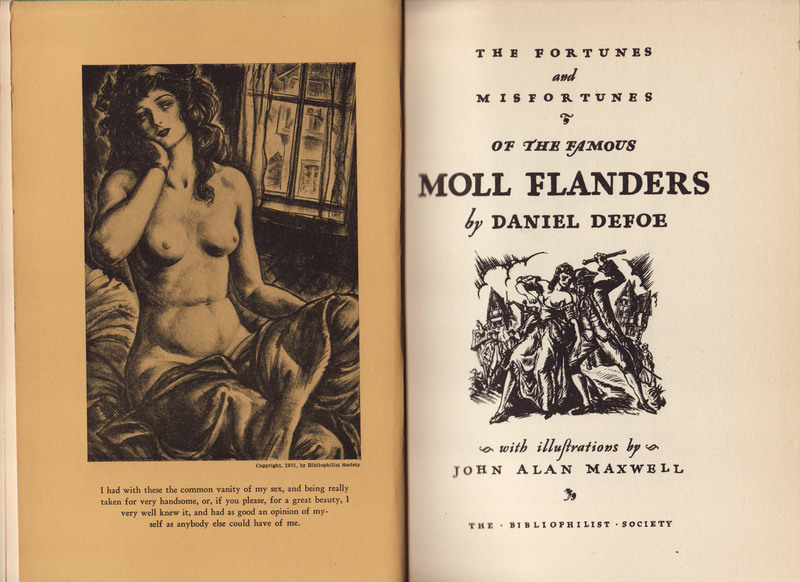 The bare-breasted Moll Flanders appears in 8 illustrations throughout the book. All are printed on slightly heavier, yellow paper, and bound in. Here, one of the illustrations serves as a frontispiece. 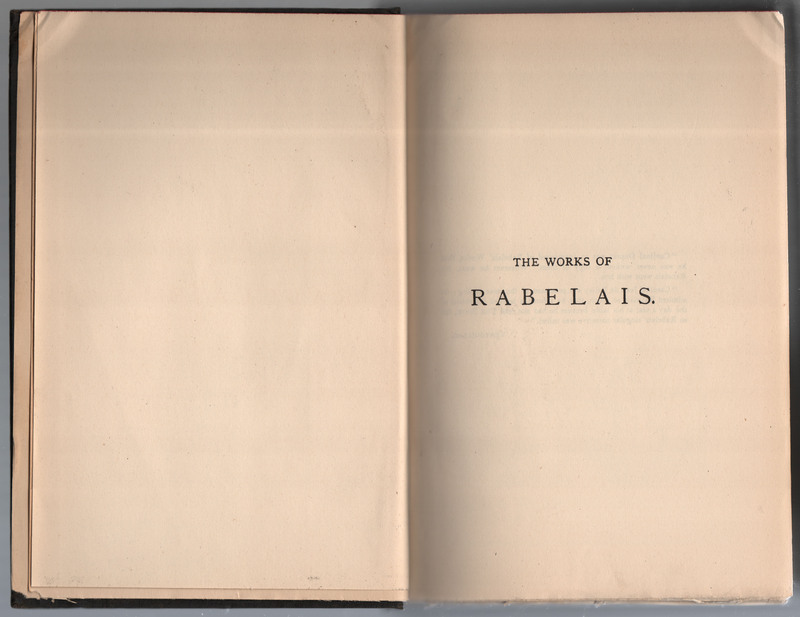 The title page includes the illustrator’s name. Copyright is 1931 to the Bibliophilist Society. Printed in the USA. The copyright is probably to the illustrations, which seem to have been commissioned for this particular title. 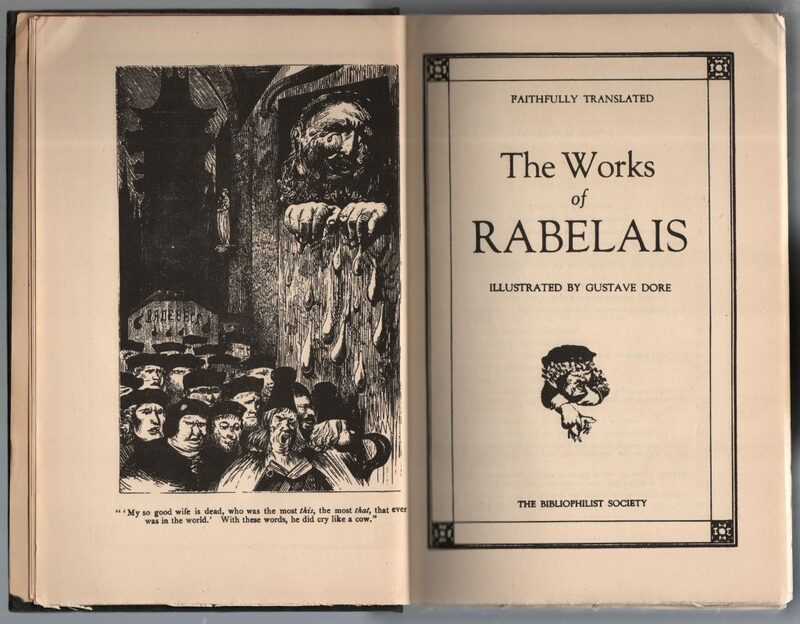 A second book, larger in format than Moll Flanders, is The Works of Rabelais as illustrated by Gustave Dore. 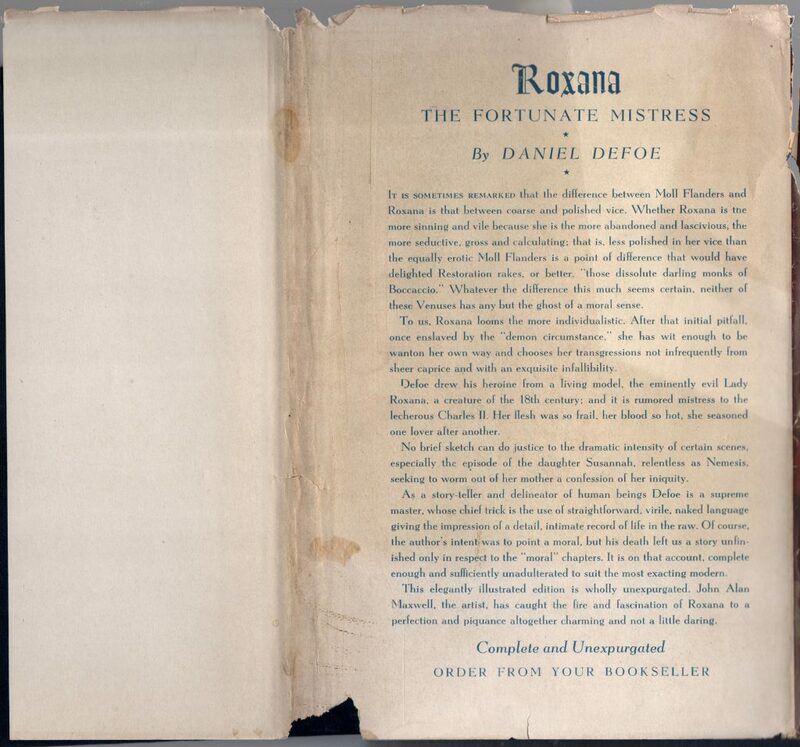 The front jacket flap contains a blurb about the title. The jacket has a unique design, and no price is indicated. 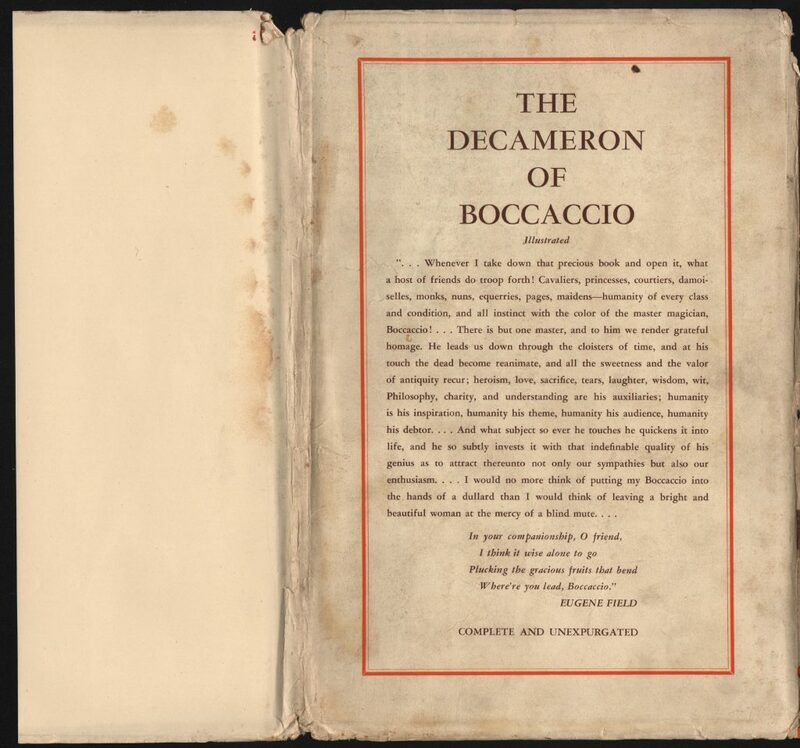 The rear of the jacket advertises Boccaccio’s The Decameron. Binding is the same plasticised material as the Defoe book above, and also has gold stamping only on the spine. This title has a half-title page. A quote by Ventoulliac about Rabelais follows the half-title page. 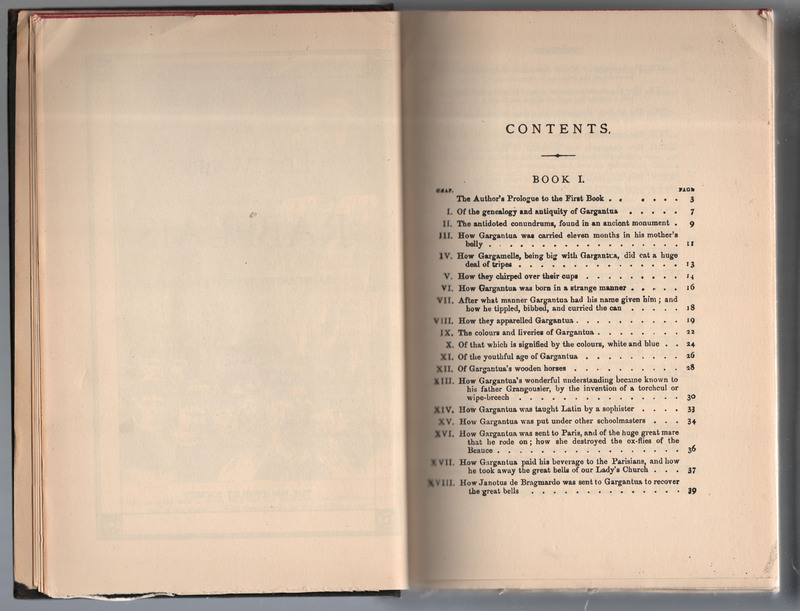 The frontispiece illustration faces the title page. 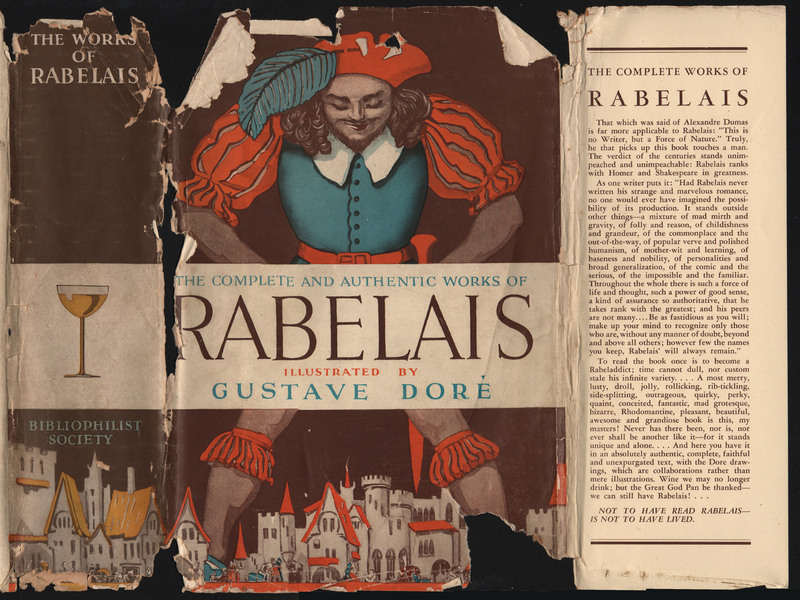 There is no copyright date, probably because this was title was printed from older plates, and the Dore illustrations were most likely long out of copyright.